The Diving Board is the prominent rock in front of the face of Half-Dome. The location offers one of the most impressive views in Yosemite. 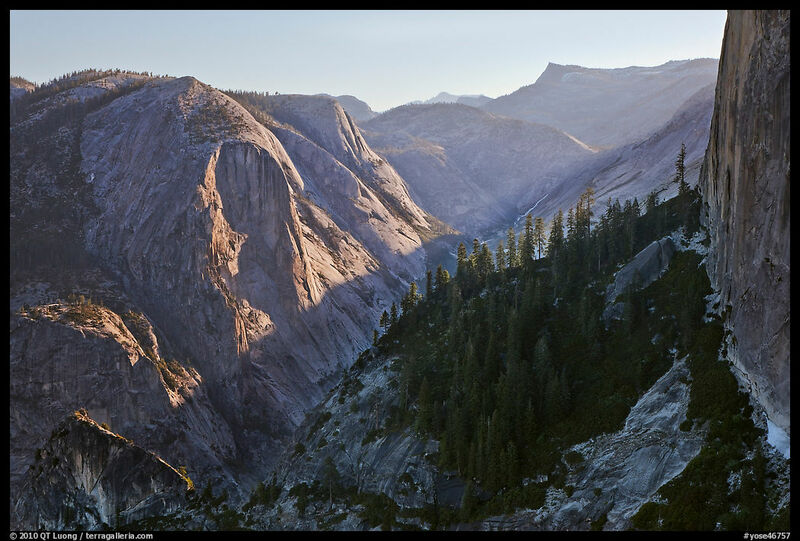 On the West, you see the whole Valley, below you is a 30 feet overhang and a 1500 feet vertical face almost straight above Mirror Lake, and on the East, you are treated to the most glorious view of the face of Half-Dome. I find the view much more interesting than the one you get from the Half-Dome summit itself, from which you do not see the face. Like the previous entry, Fern Ledge, the Diving Board is the site of a well-known photograph by Ansel Adams. This photograph, “Monolith”, has always been considered by Adams himself to be one of his most important, because it was first time he was able to pre-visualize the final print, while shooting the last of the twelve glass plates he carried that day. It is the first image included in his book Examples: The Making of 40 Photographs (by the way, one of the must-read books for any serious photographer). As an homage to Adams, there was no way I was going to leave my 5×7 large format camera in the car. Adams made the outing a day hike, but as I was going to photograph in color, I planned to stay overnight to catch the last rays of sun. I made sure to take plenty of film in order not to find myself in Adams situation ! Before getting to the description of the route, I must tell you about an eerie coincidence. Just two days before I hiked to the Diving Board, I attended a lecture about Ansel Adams by the great black and white landscape photographer John Sexton, who was one of his assistants. John happened to show footage of the Adams group on the Diving Board in 1927, shot on a movie camera brought by Virginia, who during this outing was his fiancee. As it was April, they were crawling on snowy slopes in decidedly unoutdoorsy-looking gear, holding on to a rope by hand (not harness) on the final slabs. I was surprised by Adams diminutive build, especially for someone who was lugging so much gear. The footage was set to a recording of Ansel playing the Prelude No. 1 in C major from Johann Sebastian Bach’s The Well-Tempered Clavier (digitized by Charles Cramer, himself a pianist and a extraordinary photographer). Being myself a former violonist, the Prelude is the only piano piece I can play at this moment. After branching off from the Half-Dome trail, my brother-in-law and I did not see anybody until noon the day after, when we ran into veteran rock climber Clint Cummins and his friend near Lost Lake. It had been more than a decade since I last saw him, so this was a surprise to meet him in the middle of nowhere. They were going to climb up the Snake Dike route on the West face of Half-Dome, then rappel down a steeper route to replace old climbing anchors, part of an on-going project from the American Safe Climbing Association. His friend is camping close to the Diving Board (variation B below) to work on the project all summer. Talk about dedication ! I made my photographs of the face of Half-Dome with a 110mm on my 5×7 camera, about the equivalent of 24mm on full-frame digital. Since I had brought zooms covering all the focal lengths from 17mm to 300mm for my two 5DII cameras, I could choose any focal length in digital, yet I also gravitated towards 24mm. When I came home, I was a bit surprised to see that Adams apparently chose to frame the face tighter than I did. However, a re-reading of Examples showed that Adams regrets that the 1/4 top of his negative was lost due to a fire damage. The hike does not require technical skills, nor is it exposed (that is, until you arrive at the Diving Board, where the sheer drops impressed my brother-in-law, even though he is a accomplished rock-climber). However, some scrambling, bushwacking, loose and steep terrain, and difficult trail-finding make it quite more difficult than the distance (about 6 mi) or elevation gain (3500 feet) would suggest. Allow about 6 hours up, 4 hours down. There are good bivy spots right on the Diving Board. Personally, I have hiked the Half-Dome trail only down, not up, so I could not compare it, but my brother-in-law who had done it both ways rates the Diving Board as a harder hike than Half-Dome. There are a few places on the internet where directions can be found, however, after reading them, I felt slightly confused. I subsequently understood that this was because they do not describe the same route. For the sake of clarity, I will therefore describe the most simple route first, and then mention the two main variations, which are more technical shortcuts. 1. From the Happy Isles Trailhead (altitude 4000 ft), follow the Half-Dome trail past Nevada Falls (JMT 4mi or Mist 3mi). About 0.6 mi from the new restroom, watch for a metal sign pointing to Merced Lake and Little Yosemite. 2. 100 yards after that sign, leave the main trail for an unofficial trail marked by a cairn, ascending a small ridge on the left (N). From the top of that ridge, you’ll see a view of the rounded face of Half-Dome before descending in the forest. 3. Follow an easy trail for 0.4mi, heading WNW, then step over a small creek to your right (Latitude:37.734380 Longitude:-119.528297). If instead of crossing the creek you continue straight, you’ll meet the gully between Broderick and Liberty Cap (see variation A). 4. After 0.1mi, skirt the south shore of Lost Lake, then continue for 0.4mi until you reach a rock bench forming a saddle between Broderick and Half-Dome. Continue straight (W) towards the end of this bench for 0.1 mi (Latitude: 37.735775 Longitude -119.538625 altitude 6232.0 ft). 5. The trail becomes more difficult to follow, although it is still marked with cairns. Cross a gully dropping down 150 feet, heading W, then after 0.2 mi, follow the line of steepest ascent in the forest, heading NNW on loose slopes with heavy underbrush, staying on the left. This is a steep section, as you gain almost 1500 ft in less than 0.5mi. 6. The forest becomes less dense, thanks to burn zones, but there is still a lot of manzanita to trash through. Before reaching a less steep slope, in early summer you may see a wet area with a small spring, where you may have to straddle a burned tree while walking accross a fallen tree. You eventually reach a plateau covered by a forest with almost no undergrowth. The Diving Board (latitude 37.742358 longitude -119.541180 altitude 7513.8 ft) is within sight, on the left of Half-Dome, directly directly NNE. You can also follow the ridge on the left instead of hiking up sandy slopes. A. instead of circling around Liberty Cap, follow the gully between Broderick and Liberty Cap (class 3, difficult option that only experienced climbers/scramblers should attempt). B. From the Broderick/Half Dome saddle rock bench, instead of heading W and dropping down, follow up the base of slabs towards the right (NE), then traverse left (W) on exposed ledges above those slabs below the base of Half-Dome until you turn the corner and then wade through manzanita. Posted on August 30, 2010, 9:32 am, by QT Luong, under Location guides, New images. Great write-up of your experience QT, and excellent images as always. I’ve climbed Snake Dike on Half Dome several times, but have yet to venture over to the Diving Board. I going to make a point of doing so next time I’m up there! I have not yet to venture to Yosemite but the more research I do, I feel like I’ve been there and back a dozen times. I learn a lot about the amazing adventures the park has to offer. The more I learn about the great piece of land the more beautiful the pics get in my mind, I can’t wait to start my journey for real. Thanks for the information, I will be sure to return real soon. 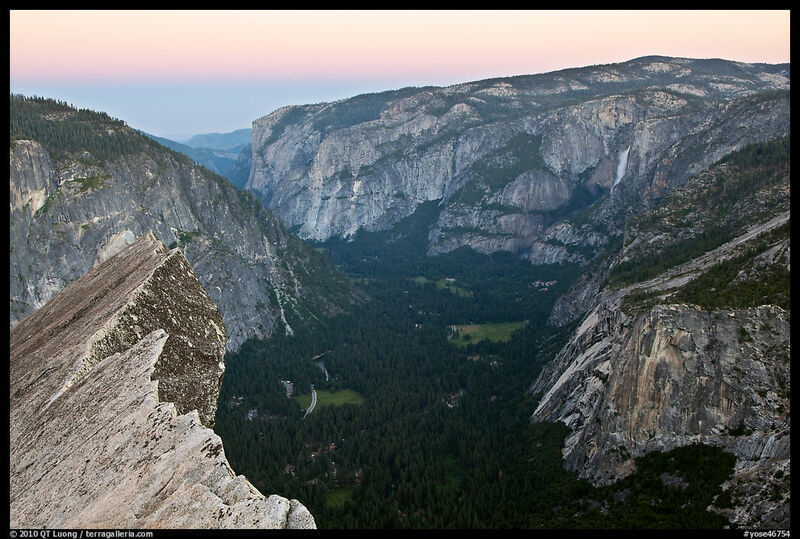 Great write-up on these three little-known gems of Yosemite Valley, QT. They’re sure to help provide a little respite from the crowds! I learned something new about the Diving Board, though. 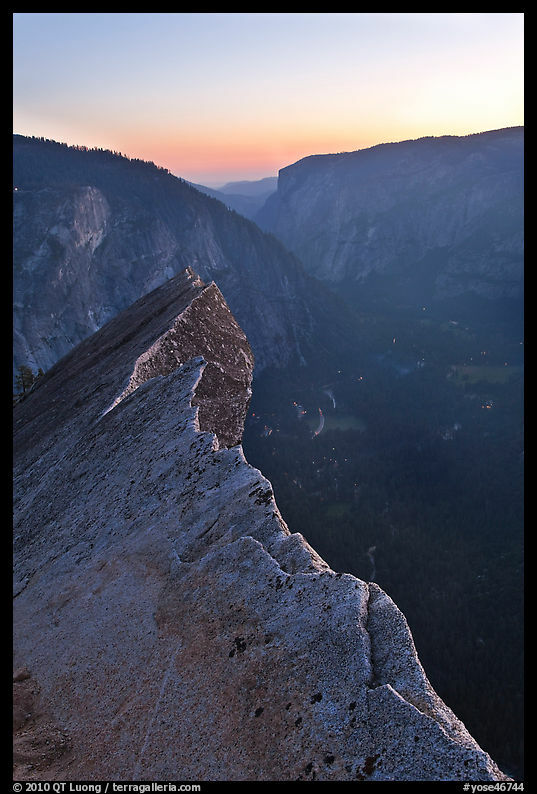 I always have thought that it was the hanging ledge on the summit of Half Dome, not located in front of it. Guess you learn something new everyday! Greg, I may be wrong, but I think that HD ledge is also called Diving Board. Having taken the gully between Broderick and Liberty Cap, I can attest that your kind write-up offers a far more enjoyable and safer route! Thanks for your blog, and extraordinary photographs! There is simply nothing like a fine large-format image, and you are a master of the art! Henri, having not tried that route myself, I appreciate your confirmation. I went to the Diving Board in 1986 with a friend. I was 28 at the time. I am NOT a climber, but was very interested in emulating Ansel Adams’s work, and absolutely had to get to the Diving Board to get some shots. As for the route, this looks familiar. We setup base camp in Little Yosemite Valley (LYV) and took the trail by Lost Lake. I believe we started up toward the Diving Board a bit too early and got ourselves into at least one scary moment scrambling on slippery granite. I seriously considered turning back, but persevered. I remember following the tree line down, which seemed much, much easier and essentially took the reverse route back to LYV. The time at the Diving Board was amazing and we had it to ourselves though we could hear climbers on Snake Dike while en route. I want to get back once again and repeat this adventure but I’m 57 now and while still in reasonable shape, I will think long and hard before attempting. Fortunately, getting data on the Diving Board via the Internet is way easier today than our experience was 28 yrs ago in ’86, where you had to find books with various routes described. Thanks for the great article inspiring me to do this hike. I made a video for the hike and linked this article in the description. Thanks for sharing the video, well done! I was happy to see the smile on your face during the hike. I’m working on my fitness to be able to do this next year. I downloaded the KMZ but it seems to be corrupt. Do you have a fresh copy of it? Paul, the file is not corrupt. I have compared it with my original file and they are identical. The problem is that it was generated in 2010 and Google changed something in the file format in the while. The data is there if one knows how to convert it to the updated file format – I don’t. Great post. I’m planning on photographing Half Dome from the Diving Board sometime in mid-October of this year. Is there a time of year where Half Dome gets better late-afternoon/sunset light than others? 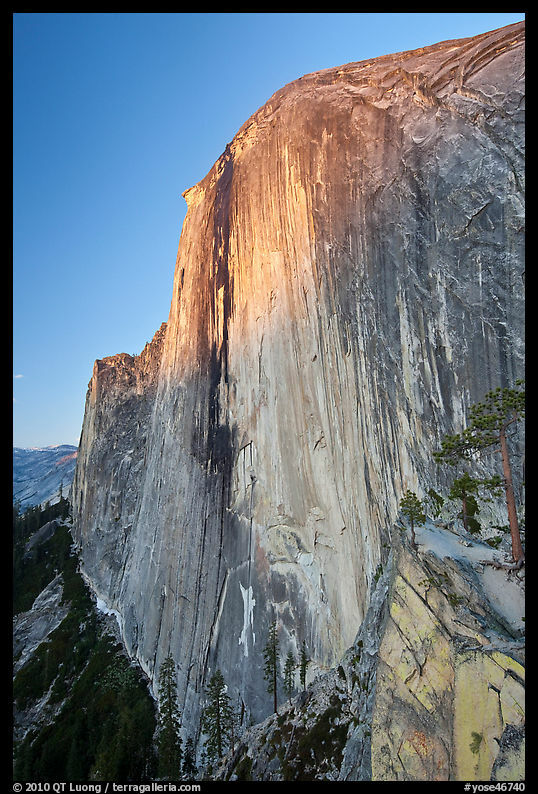 Montgomery, If you are thinking about the sheer NW face of Half-Dome, the last light is best around the winter solstice (November to January), so your mid-October date is pretty good, as snow might complicate the approach later. « One year already – what next ?